Izhavia Airlines, which along with its home airport business collaborator was formed in 1992, can trace its history back to 1944 when Izhevsk United Air Squad was founded in the city of Izhevsk as a local aviation division of Aeroflot. Located some 1,200 km to the south-east of Moscow, Izhevsk, the capital of Udmurtiya Republic, has a population of 650,000. As with the majority of aviation enterprises founded in the era of the Soviet Union as regional ‘aviation squads’, the company is composed of both the airport and the airline, and remains fully owned by the regional administration. In larger cities, many such combinations underwent the inevitable, and not always painless, separation process, a scenario which resulted in more or less independent airport and airline businesses, each forced by economic realities to determine their own paths to sustainable development. Typically, the airport would find an investor or a third-party management company, or join an airport holding and, using its monopoly position, might then benefit from increased competition between carriers. For the airline, on the other hand, life after divorce may not have always been so easy. It would have to find its own niche, possibly building on the strengths of its region, merge with a partner, or end up leaving the market altogether under pressure from larger competitors. In smaller cities, however, with less traffic and undeveloped local or regional route networks, the existing synergies would sometimes justify the argument of preserving the airport-plus-airline status. But the evolution of the Russian air travel market and the gradual demise of the Soviet-built regional fleet of Antonov An-24/26 turboprops and Yakovlev Yak-40 tri-jets has, sooner or later, motivated each regional operator to look for a new way of balancing the conflicting interests of its businesses. This time has now come for Izhavia Airlines and Izhevsk Airport. In May of this year, the airline took on a new management team. In this interview with Russian Aviation Insider’s sister publication ATO.ru, Alexander Sinelnikov, its new general director, shares his concerns, plans and projections for the inevitable changes which lay ahead. Alexander Sinelnikov started the interview by admitting that both Izhevsk Airport and Izhavia Airlines currently lag behind the competition. Its airport terminal and its fleet of ten 120-seat Yak-42 jets and three An-24 turboprops (which it leases out) are largely a legacy of the USSR era. As a result, it loses passenger traffic to upgraded rival airports in a 400-km radius of Izhevsk – such as Kazan (390 km), Ufa (342 km), Perm (222 km) and Naberezhnye Chenly (202 km). “Along with that, we remain the only carrier in the Privolzhsky Federal District which operates aircraft with a seat capacity of more than 100 and flies not only to Moscow, but between regions as well. The majority of our scheduled flights [link Izhevsk] with Moscow and St Petersburg as well as to Black Sea leisure destinations in the summer. About half of our operations are charter flights, including the transportation of shift workers for oil and gas companies, and corporate charters,” Sinelnikov explains. The Yak-42s are “as reliable as Kalashnikovs” he quips, in a humorous reminder that Izhevsk is home to the Kalashnikov Group, maker of the renowned firearm. 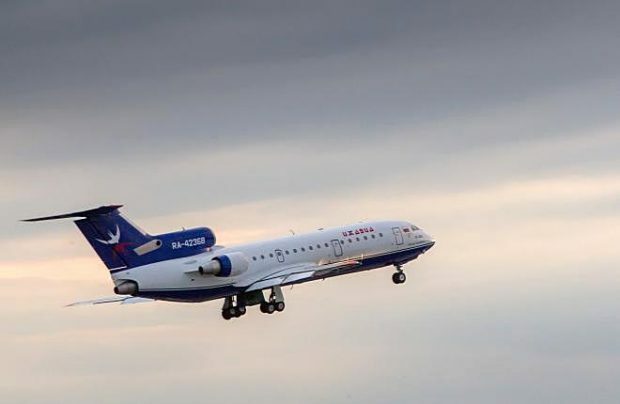 The airline, one of two remaining Yak-42 operators in Russia, is even looking to bring more of them to its current 10-strong fleet by purchasing the aircraft from the recently shut down Saratov Airlines, and has already hired some of the defunct airline’s flight crews. Acutely aware that no aircraft will last forever, Izhavia is now in search of the right replacements and additions to suit its route network ambitions and help it compete with larger airlines. At the same time, facing up to the changing economic realities, Izhevsk airport also knows it cannot afford to serve just one airline. Attracting potential new airline visitors to Izhavia – including Aeroflot – is vital to justify investments in its infrastructure upgrades. Therefore the company’s new management is looking to modernise the fleet, but only through the acquisition of “tried and trusted” aircraft. The company’s previous management had considered Russian-built aircraft such as the MC-21 and Ilyushin IL-114. “We want only factory-new aircraft. We won’t experiment. We’ll take [those aircraft] that will enable us to compete at the highest level with industry giants. That’s how we’ll find our niche. As of now we see it in providing regional services from Izhevsk and other cities in the Privolzhsky District. We are now in the process of creating the business model for the next five years and choosing the right aircraft type, based on its fuel efficiency and maximum margin for RPKs,” says Sinelnikov. In his view, the operational economics for smaller capacity aircraft “are hard to calculate” and cannot satisfy Izhavia’s commercial requirements. “Small capacity aircraft almost always means being dependent on state subsidies and we are striving to build our business without such subsidies, so we need larger aircraft,” he insists. “We are eyeing the Boeing 737-800, the Boeing 737MAX family, as well as Airbus A320ceo/neos. We’ll make the decision based on calculations and on which manufacturers or lessors come up with the best offers,” he concludes. Once the new aircraft join the fleet, the airline will start expanding its route network, primarily within the Privolzhsky region. “This is the niche we are going to take. If we find another high-revenue opportunity, we will go there as well,” Sinelnikov says, pointing out that if Izhevsk Airport becomes international, the airline may even launch international services. The Moscow market is not the target, he emphasises. At present the airline operates four daily flights to Domodedovo in the capital, but is still counting on the federal government lifting the burden of VAT for those flights linking regional centres directly, not via Moscow. The tax-reduction initiative was previously tabled by the Airports of Regions grouping – “and is already a decade late,” Sinelnikov observes. The state subsidy programme of unprofitable regional routes, launched in 2013, had Privolzhsky District as its pilot project, and is now working successfully across Russia, but being dependent on financial support from the federal budget is not what the airline aspires to. It currently relies on subsidies for only two of its routes – from Izhevsk to Nizhnevartovsk and Simferopol. Izhavia also operates flights from Ufa and Krasnodar. “Our charter network is spread across Russia, with 26 destinations. Izhevsk is our main base, but we also have a maintenance base at Chelyabinsk,” the executive says. For the airport, such dynamic changes are just as pressing as those for the airline, and may happen even sooner. In a bid to attract increasing numbers of transfer passengers, the airport’s existing passenger terminal is to be redesigned to provide more space. Improving the passenger experience while at the same time increasing the share of non-aviation, ancillary revenue, is also on the agenda. “By means of transit flights and hub technologies at Izhevsk and other airports of Privolzhsky District, we will lay the foundations for developing the airline business, making sure that this regional airline model really works. There are not too many examples of viable regional airline models,” Sinelnikov points out. The Izhavia and Izhevsk airport synergy is expected to help the company boost its transit traffic by “arranging connecting flights and using hub principles, so that passengers at their departure airports are guaranteed to be able to continue their journeys to their final destinations.” Whether other airlines will fit efficiently into this scheme is not yet obvious, but Sinelnikov says he will conduct negotiations with market leaders such as Aeroflot and S7 Airlines. The airport is also currently working on offering an improved service at its business-class lounge, and is looking to increase the range of services available for passengers. Although the annual capacity of the existing terminal building is already up to one million passengers, the construction of a modern facility equipped for handling international flights, is on the agenda, although implementation of this infrastructure plan may take up to five years. In the meantime, from this month, the airport has completed preparations to initiate the handling of Sukhoi Superjet 100 (SSJ100) aircraft, thereby enabling Aeroflot to launch scheduled services to Izhevsk from the Russian capital. In 2017, traffic through Izhevsk grew by 29 per cent over the previous year. This year the target is to handle 400,000 passengers, roughly as many as last year. The regional administration has already announced that the airline and the airport will be separated before the end of this year. “This is an absolutely sound measure, when businesses are separated,” the new general director of Izhavia insists. “But we are still counting on one company managing these two separate entities.” Keeping control of both businesses in the same hands will “help avoid the situation where the balance of interests of the airline and that of the airport are in conflict,” he says. A single management company would regulate the potential divergence and ensure the sustainable development of the airline. The separation process is due to be completed in late 2019. The regional administration is hopeful that separating the airline from the airport will also help to attract investors for the latter, or possibly the interest of one of the three existing major Russian airport holdings: Airport of Regions, Novaport or Basel Aero. Nevertheless, the new management team believes it can itself find an investor and raise funds, without the involvement of the established holdings. “With [our own resources] of Udmurtiya Administration and the competences accumulated by my team, we can raise funds and deliver the outcome that the region needs – a new airport, new infrastructure, a revived and competitive carrier – all without changing the ownership,” Sinelnikov asserts. He does not believe that privatisation of the assets is a necessity, because after separation both businesses would still be retained in the hands of the region. “Why not work for the state? Why are state-run companies successful in the energy sector, but not so much in commercial aviation? These are the questions we are going to answer,” he affirms. Obviously, once the airport starts attracting new carriers, these rivals may divert passenger numbers away from Izhavia. But the airline will “monitor this situation” and “try to keep the balance.” At present, Sinelnikov admits, the airline is coping adequately with the many changes taking place in the industry, in part due to its close connections with the region’s airports, although it is also working on implementing new options for attracting passengers across a range of price segments. The arrival on the scene of the mighty Aeroflot may complicate the situation further for the airline, but Izhavia’s manager is optimistic that the airline will preserve its niche. He believes that serving Moscow will remain the primary aim of the national carrier whereas, in contrast, Izhavia will instead concentrate on building its regional services portfolio. “We believe Aeroflot will mostly attract passengers that use its services on other routes and those that need Aeroflot’s connection flights from Sheremetyevo. We offer connections at Domodedovo in Moscow. Consequently, the transit passenger flow in general may increase, and that is another positive factor,” he concludes.